If you have identified an opportunity, make sure that you go back and use one or two of the activities and exercises to ensure that there is a real problem that you are addressing. In the end, an opportunity is essentially a response to a problem that mobilises latent capabilities that haven’t yet been exploited for greatest effect. 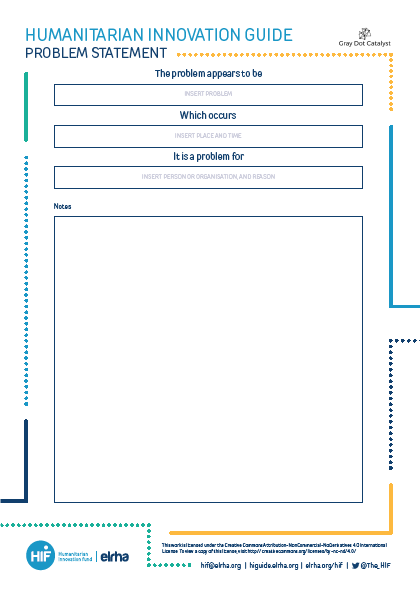 If you have clearly identified your problem, then it is time to develop a problem statement. This is an articulation of your initial understanding of the problem. As you move through the Recognition stage, you will find that your understanding of the problem area expands and deepens. But articulating the problem statement at this point is a significant step in the overall Recognition process. The problem appears to be [insert problem] which occurs [insert time and place] for [insert person or organisation]. Would members of the affected population recognise this problem statement? Does this problem statement cover vulnerable groups? Does the problem affect an organisation? If so, is it shared across other humanitarian actors? When identifying the time and place of the problem, is it in a particular phase of the disaster management cycle? Ensure that you spend time developing and honing the statement, alongside other members of your project team, and try to get further feedback from people who have not been involved. You may also want to include further things to consider, such as outstanding questions, assumptions you may have made, or other information you think may be pertinent for exploring and understanding the problem area further. Add these in a few additional bullet points.